Sea turtles are a common sight in Apo Island! Indeed, the Philippine waters for me is the best snorkeling arena. It holds never ending possibilities for water adventures. As an archipelago, it has long list of remarkable destination for snorkeling not to mention diving, from coast to coast and from one island to another. Just like diving I can do it whole year round without waiting for specific season, the waters just waiting to be explored. The first half of the year gave me opportunities to discover and rediscover marvelous realms allowing my body to float, relax and wonder in nature’s wild in the depths. And yes, the great depths will never exhaust its mystery, infinite as ever and it could only stir up one’s curiosity. My snorkeling expedition in the past months had fanned my increasing love and passion for the blue world. The quest for Donsol was finally realized in March, the long wait was compensated with wonderful sightings. It is however, an advance open water snorkeling – that’s how I described the rigidity of finding these gentle giants. It requires agility and speed, sharp eyes is also a must. I think the slow and inattentive would never see one, in a blink of an eye they were gone. Again, only the focus mind will experience the magic. 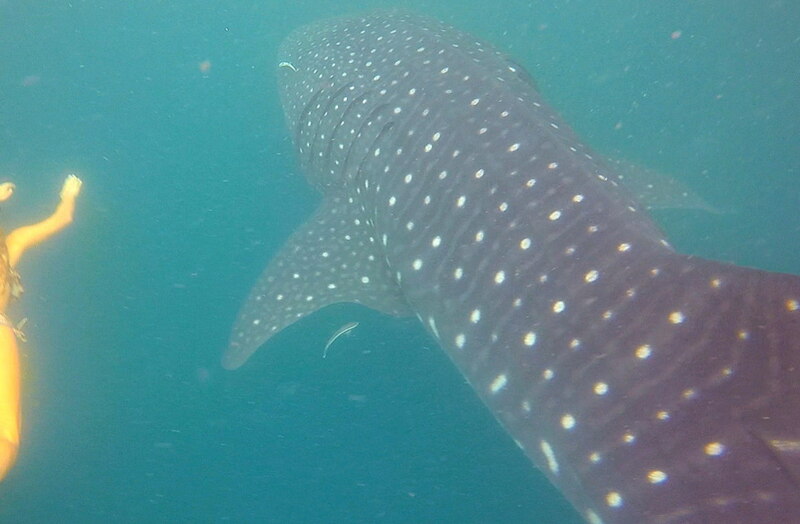 The first whaleshark we encountered in Donsol was this big. Such adrenaline rush! Donsol indeed is gifted by nature with rich waters that it maintained its breeding grounds for the largest fish. This once sleepy town suddenly become a flourishing destination and sought out by many, local or foreign. 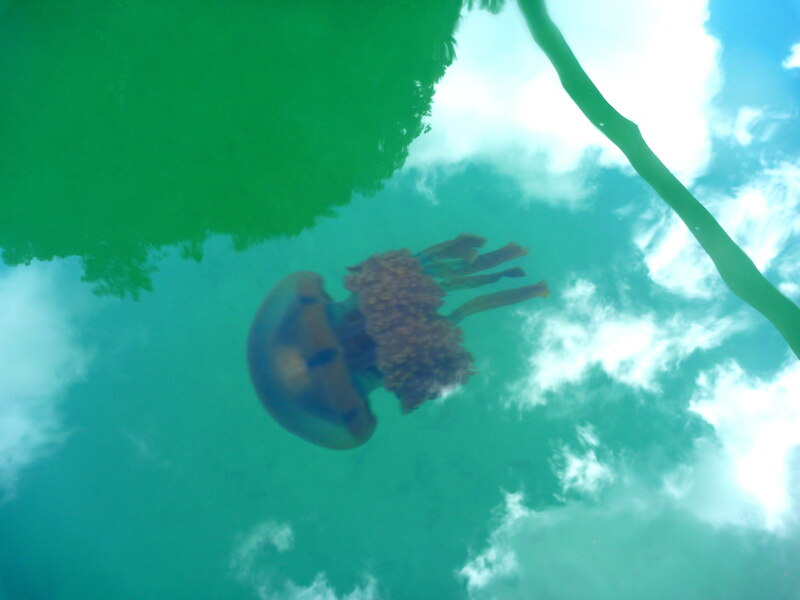 I went for a quick visit in Bucas Grande group in April to savor its homey environs and I was blessed to catch up the stingless jellyfish in Tojoman Lagoon. Although not yet in full season, their presence have warmed my heart, and added joy in my homecoming. I swam with them again silently, just floating side by side and watch them pulsating. I was wondering if ever they saw me, because they were never disturbed of my presence. My jelly friends were always there to welcome and swim with me. Snorkeling in the emerald waters in the lagoon always highlighted my trip to the islands. Perhaps, there is no other richer marine sanctuary I visited than Apo island, its shallow waters was teeming with marine life I can only find in the depths of other sites. We were lackadaisical in our dive plans in Dumaguete, we just trusted the diveshop so we left everything to them, our June dive trip was pure bliss! And it was a blessing again our dives were in Apo island, I remembered the rich encounters we had five years ago! So I had the opportunity to snorkel and explore its shores during our surface interval. It was much longer as we expected, our lunch break was more relishing after my wonderful sightings. The lovable sea turtle never cease to amaze me! I got down from our dive boat, wade in the waters and swam in the sanctuary, allowing my body to float freely in the shallows. It wasn’t long before I found many sea cucumbers scattered around in different species, size and color. 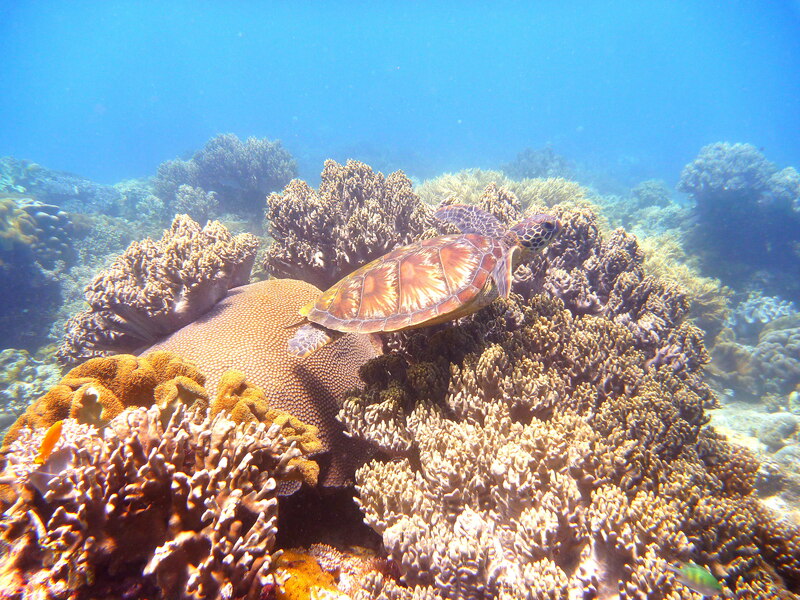 Then beyond were two turtles, rummaging the corals around, eating moss and occasionally swam up for air. Such a beautiful sight! Perhaps I don’t look threatening, they were never disturbed of my presence as I watched them silently. I sighted banded sea snake also. 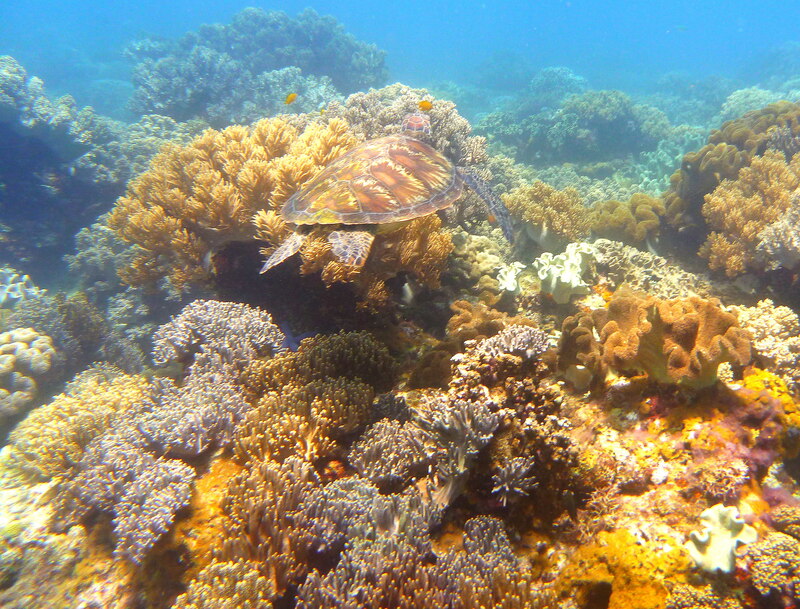 I can’t get enough of gliding through the waters and marveling at the corals, colorful fish and plants. There are over 650 species of fish and 400 different species of coral in the protected waters around Apo Island, which is why the island is such a popular dive spot – even included in the 100 best diving sites in the world. Yes, it happened from north to south through the islands – in Luzon, Visayas, Mindanao! Have you gone to these sites? If you do, bring your mask & snorkel next time and discover how rich the waters right here in the Philippines arena!